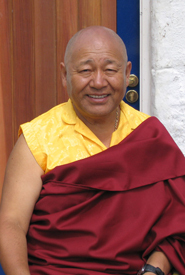 Born in 1943 in Kham, East Tibet, Lama Yeshe spent his formative years in education at Dolma Lhakang Monastery where his brother, Akong Tulku Rinpoche, was Abbot. After a harrowing six month journey escaping from Tibet as a teenager in 1959, Lama Yeshe arrived in India along with Akong Rinpoche, Chogyam Trungpa Rinpoche and a handful of other exhausted refugees. On leaving the Tibetan Refugee Camp he attended theYoung Lamas Home School in Dalhousie and left in 1967 to serve as Private Secretary to His Holiness the 16th Gyalwa Karmapa at Rumtek Monastery in Sikkim. In 1980 he took full ordination as a Gelong monk from His Holiness Karmapa, on the auspicious date of the anniversary of Lord Buddha's Nirvana and Parinirvana, at a ceremony attended by the most eminent Tibetan Lamas of the time. Following his ordination Lama Yeshe entered a strict, long-term solitary retreat under the guidance of the Abbot of Karma Triyana, Khenpo Karthar Rinpoche. Lama Yeshe Losal also received teachings from many of the highest Kagyu Lamas, including extensive instruction and initiations from his root guru H.H. the 16th Karmapa,and from The 12th Tai Situpa, Jamgon Kongtrul Rinpoche, GyaltsapRinpoche, and the Very Venerable Kalu Rinpoche. He later received specialised teachings from Tulku Urgyen who supervised Lama Yeshe's 49 day Bardo retreat of total solitude and darkness in Nepal. In 1997 Lama Yeshe was able to complete a second 49 day Bardo retreat on Holy Island in a specially built retreat-master's cabin.This rare accomplishment has made him one of the foremost meditation Masters alive today, about whom His Holiness the 17th Karmapa recently said, "If you want to know about meditation, look no further than Lama Yeshe Losal." Under Lama Yeshe's direction Samye Ling continues to flourish and is now home to an increasing number of resident ordained Sangha and lay practitioners. The Centre attracts thousands of visitors who come to enjoy the magnificent temple and grounds or to attend one of the many courses on offer. In recognition of his achievements at home and abroad the title of 'Abbot' was conferred upon Lama Yeshe in 1995. One of his first actions as Abbot was to establish the Samye Sangha Foundation to help the monks and nuns become self-supporting. 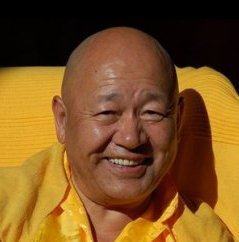 His charismatic presence and good humour gives Lama Yeshe the ability to connect with people from all walks of life making him much in demand as a guest speaker at many high profile events' such as the prestigious Shell International Conference at Maastricht where he was invited to speak to the top six hundred managers in 1999. A year later he attended a week long conference of the Global Business Network in Sonoma USA, where he addressed leading CEOs from many of the world's multi-national companies on the benefits of meditation.